Which Fictional People Made The Worse Judgement Of Character? Have you ever made a judgment call on someone, only to be proven wrong? Or have you made a decision that you thought was the best thing ever for someone close, only in hindsight to realize it was a terrible mistake? We all make mistakes, but luckily for nearly everyone reading this, our failed judgments don’t effect the entire world if not Worlds. This is not so for many fictional characters whose bad calls can lead to death and destruction on a massive scale if not stopped by a hero (sometimes even being stopped by the same person they made the bad judgement on). As such, which do you believe are the characters who made terrible judgement calls? Whose choices unwittingly turned someone evil or nearly doomed everyone, the only saving grace being that no-one had actually listened to that character. For my own part, I have two characters whose judgement calls brought about major disaster. Please feel to disagree of course if you feel I’ve been unfair. 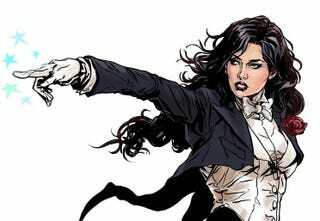 Zatanna is a regular of the Justice League and is considered one of the great magic users of the DC Universe. Normally her Judgment of character is great and is a useful asset for the team. However, when she screws up, she really screws up. Her first really bad judgment call was in 1980 with Raven who had went to the Justice League to help her stop her father, Trigon from conquering all of creation. However, Zatanna informed them not to because she could sense her demonic heritage and thus, she could not be trusted. To point out how demonically stupid (really JL, you weren’t even going to check and spy on the demon lady you thought was evil?) this was in hindsight, if Raven hadn’t decided to recreate the Titans, Trigon would have most definitely taken over Earth. Her next act of stupidity would be discovered in 2004 in the comic Identity Crisis where it is discovered that she mind-wiped Batman after he had discovered her mind wiping Dr Light (and later she’ll wipe Catwoman and the Secret Society of Super Villains). Results of her quite frankly evil behaviour (why didn’t she get kicked out of the League or at least punished for evilness) resulted in billions dead in the coming years with the biggest death count being in Countdown. Speaking of which, her final bad call would be in that wretch of a series when Mary Marvel, after gaining the power of Black Adam goes to Zatanna to help learn to use her powers. However, after realising that her powers are evil and seeing Mary struggling to control them, Zatanna… abandons her, which allows Darkseid to turn her into a villain. Aulë is a valar in the realm of Arda in J.R.R. Tolkien’s writings which is basically a god. He is also the creator of the Dwarves as well as the Sun and the Moon. Did I forget something? Ah yes, he can also be pretty much be blamed for everything wrong that happens 2nd Age onwards in Middle Earth. Why you say? Well, the Valar have servants called Maiar spirits and during the age of the trees, many of these spirits were sent down to stop Morgoth, the First Dark Lord and God of Shadows who had conquered Middle Earth. Aulë, decided to send Mairon, his most beloved student to stop Morgoth, knowing his strength and knowledge could defeat even the most powerful of baddies. What ever happened to Mairon anyway? That’s right, Mairon quickly became Sauron, becoming Morgoth’s top Lieutenant and eventually would rise as the second dark lord. To deal with Aulë’s mess up, the Valar created the order of the five wizards to aid Middle Earth. Aulë, trying to make up for his mistake, decided that his other top student, Saruman would be the perfect leader and would definitely defeat Sauron.